We all wish, maybe, sometimes that the reality we get could have been scripted or re-written if required. Regardless, human nature is something which unfortunately, cannot be changed. It has mainly downs, goes far and beyond the animal nature of man and does unthinkable and gruesome things you and me would not like to ever happen. Michael Crichton, back in 1970s was able to tell us about what we were not supposed to know. Now, HBO’s WESTWORLD reminds us what we are capable of, if the opportunity is given… and that, I am afraid, is not necessarily a good thing. Dolores Abernathy (Evan Rachel Wood) is sent back to Westworld’s headquarters for re-adjustment. By the time when the pilot episode ends, you will realize the reason she needed to be reconfigured. But the question she was asked in the beginning, did she ever had doubt about her reality” for a thinking audience will be enough to figure that out. Dolores loves her world the way it is. As per her, she says, some prefers to see the ugly side of the world, while she sees only its beautiful side. But the thing is, not everyone, especially the guest of her city shares her enthusiasm. The Man in Black, or cult character, Gunslinger (in original version played by Yul Brynner) now has been taken over by the incredible Ed Harris, who is the most dangerous man everyone, including the audience must fear. He is brutal, insensible and cannot be killed, but mortal though. He has certain interest for Dolores and wants to find the labyrinth, the reason for it we are yet to find out. He had visited the part for last thirty years and killed more people than anyone else. Teddy Flood (James Marsden) portrays Dolores’ love interest, who I suppose will die as many times as required, in the name of love. However, thanks to the engineers, they always can fix him and bring back to the field. After all, none of them are real, except the real world that scripts the chaos occurring in the Westworld. Sir Anthony Hopkins’ Dr. Robert Ford is a man who certainly created the world, who now thinks about a second one, something unreal and able to blow away any mind. If you got a chance to see the film version of WESTWORLD then you know how much materials the HBO has in its hands to develop. It is certainly one of the most captivating and intriguing series nowadays that, I repeat, cannot be compared with THE GAME OF THRONES. WESTWORLD might have an equal amount of violence scenes THE GAME OF THRONES has, but it also studies well the human character and its psychological aspect, that I am afraid is really terrifying. It is able to hit its core, go as deep as possible to show how far the scientists can go to give a man what he wants. In the WESTWORLD only the guests are villain. 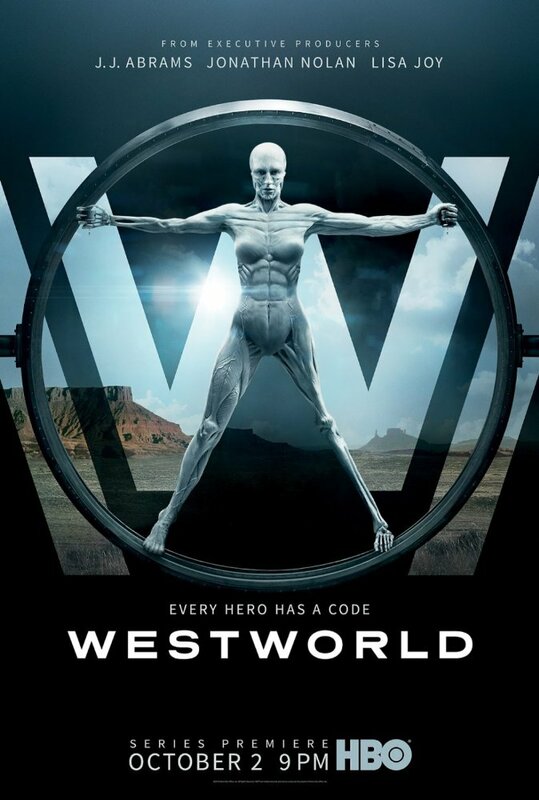 With their appearance they terrorize already shattered world, while one mastermind writes the screenplay, as for some reason, you will hear that a human needs to kill, and that is the part of entertainment of the WESTWORLD. Good or bad, that’s not a question, but the answer the series provides is that it’s going to become the most talked about TV production that, I am sure, none of us would like to come to an end. Great review (I’ve reviewed the pilot myself, along with the 1973 film)! I was very much impressed with this first episode, compelling ideas, great direction and superb casting. Ed Harris and Anthony Hopkins are excellent. Looking forward yo further installments!